Behind the Bit: Am I too big/small for this horse? Am I too big/small for this horse? but she's a tiny peanut up there! Most people I know, whether tall or petite, want a horse that is BIG. Being 5'10" and having little choice in the matter, I marvel that smaller riders aren't enjoying the considerable benefits of a smaller horse -- say, 15.2 to 16.2. They have fewer soundness issues, use less resources (bedding, etc), they don't require an oversized trailer, stall, or horsewear. They are often easier for ladies to ride successfully. Aesthetically, finding a right-size horse depends on a lot of things. I can name a few, what other considerations are there? How does the horse feel? Do you have enough horse in front of you? A smallish horse with a long neck may be just fine, while a larger horse with a shorter neck may leave you feeling like you're too close to his/her ears. Where does your leg fall? Personally I don't feel this is of much importance, but a lot of riders don't want their toe to fall below the horse's belly. Does the horse have a delicate build or a more substantive, chunky build? A gazelle-like horse will look better with a petite or slender rider while a chunkier horse may accommodate a broader range of rider builds. I think this looks okay; the rider position on this pony contributes to a balanced look. I suspect it's a trainer in the irons. Do you have a short or long torso? If you have a short torso, I feel you'll look nice on a smaller horse. Someone the same height with a longer torso may look a bit unbalanced. What is the horse's work style? Does he/she need to be muscled around or can you shift a seatbone and get a reaction? Where does your saddle fall on the horse's back? The saddle should not dwarf the horse's back, the last few ribs of the horse should not be covered by the saddle. I suppose rider weight has some bearing -- especially how they carry weight. Someone with weight in their hips/thighs will "fit" more horses than someone with an apple shaped build or someone who is top-heavy. A heavier rider generally will look better on a more substantial horse. 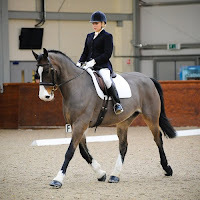 If you are concerned whether a horse can support your weight, check this page. I didn't really "research" this as I'm speaking more from the aesthetic viewpoint -- these are all just my opinions, based on observations and maybe a little reading that I don't remember enough about to cite. What do you all think? My Tucker is nearly 17h and I fit him fine. He has a short back so he's not hard to hold together. Chance, on the other hand, is somewhere between 15.2-15.3h, with a broad body, and I fit him as well. Toby is 16.1 which has always been and ideal size for me, and I fit him as well. All three have different body types and that makes all the difference in the world. I put a petite rider up on Chance and he looked HUGE! Big horses are more popular, but not necessarily the ideal for every rider. I think appropriate size is not only an aesthetic issue, but also a riding ability concern. It doesn't really matter if you appear proportionate on your horse if you can't put it together properly for your chosen discipline. we used to joke at my barn when I was growing up - the smaller the rider, the bigger the horse she wants. I'm 5'6", and I ride a 15.2 arab. He's perfect for me. Eldest is leasing a QH who's not quite as big as my Pepper but close (I haven't measured, but I estimate he's 16.1). However, she's 5'9" to my 5'6" and really appreciate Oscar's size although she occasionally rides a 15.1 gelding. She feels more in proportion to him with her long legs than with the other horses that she's ridden at the stable. I'm only 5'0", so I aim for small - first guy was 14.3hh and he was a great size for me... New guy is 15.1hh and I don't think I would want a horse much taller, unless it was really narrow. Any horse that takes up a lot of leg, regardless of height is super hard for me to ride. "Does this huge horse make me look slim?" I believe that is the issue and it is all about our society's complete sickness about body image. never mind the soundness issue for the horse. When 16.2 counts as a 'smaller horse', we are already down the rabbit hole. I'm 5'0" and always owned 16+ horses till this year. I am now the proud owner of a 13.2 Connemara/Welsh Gelding and I am in love. Here's a photo from a training session this summer. Please ignore the dressage bridle and jumping saddle! My dressage saddle was being repaired. His name isWiley. I do NOT like big horses -- I used to go for the romanticism of a tall mount when I was about 18, but I have long since discovered that it is much easier to actually ride a "normal" sized horse (in the 16 h range) and they have far fewer worries about soundness and wear and tear. And I have very long legs too, but I am not interested in a horse much over 16,2 or so for maintenance and tack reasons. My horse is what I like to call "normal sized", she's 15.3, and has a fairly slim build. Not too big, not too small. Her long neck balances things out. I'm a 5'10" (11?) beanpole rider, which sounds a bit big, but on the ground and in saddle it seems to be exactly proportional, not too big not too small. Being an absolute amateur with no muscle mass, and her being a bit more on the hot side, I'm glad she's not any bigger than she already is. I couldn't imagine trying to handle when she has her moments if she was over 16 h! I guess it should be more of what the rider gets along with, not how good the rider looks on them. Everyone imagines themselves on a big Friesian or warmblood but the reality is if they really had one, they might not be able to handle it! But you are right, the aesthetics are something to consider. But really the rider should go by how they feel with the horse. If they go by looks, they could end with a horse that is totally unfit for them! I am 5'8" and athletically built (not slim by any means) and I feel big on my 16.2 TB, because he is very slab sided, though height-wise he fits me well. I used to rid a 17h TB and have decided that I don't want anything that tall again. If I ever get a warmblood I hope he will be in the 16-16.1hh range! I'm 5'9" and my mare is just a smidgeon short of 15.1hh. She fits me just fine. My son rides a 14.2hh quarter horse mare, stocky built. I ride her occasionally and surprisingly, I don't feel too big on her. I think a lot has to do with the bone & conformation of the horse. I'm 5'6" with a short body and long legs. My mare is a 15hh QH with a barrel like... well, a barrel. She takes up enough of my leg that I've been assured many times that I don't look oversized or out of place on her, and she's challenging enough to ride without having more weight to throw around. I have friends who breed WB's, and I join in their headshaking when tiny riders come to try enormous horses. Sometimes you wonder how the horses are supposed to feel their leg aids! I'm 5'9, maybe 5'10 ish. My horse is 16.2hh. And yes, I know his hieght better than mine! Harry has a wonderfully deep girth, and my legs sit well on his sides. I wouldn't mind a horse a hand or so smaller, as long as it had a similar sized girth, and enough bone to carry my weight. It would make it a whole lot easier to get on, that's for sure! As a kid I rode a couple of ponies where my legs hung down below their bellies and I never liked it. I felt huge and unwieldy and like I couldn't apply aids efficiently. The older I get, the shorter I like them. I think great smaller horses are overlooked a lot of times since the tiny ladies think they need a horse over 16 hands. I too am tall, nearing 6 feet and am more comfortable on my big horse (16.3) since my leg actually has something to touch, instead of me having to steady my lower leg in mid air. On small horses my leg dangles below their bellies. um well i have a 14.3 QH and im pretty small and light weight.He is a bit plump but im not very long legged so do you think that he fits me? I ride a 15.3hh gazelle(though he's only 3, so I do hope he fills out some), and I'm probably considered a bit big for him. I'm 5'8" w/ long legs; and in dressage length stirrups, my toe will be right about even w/ the bottom of his belly, maybe up to 3/4 inch below, depending on the angle one is looking at us. He's pretty long and leggy, though, and I feel good riding him. I'm pretty comfortable riding anything up to about 17.2hh(assuming the horse isn't too terribley wide), above that I don't feel like I can get enough lift in w/ my leg. I adore ponies, too, but at my height, all but the largest ponies are kind of impractical. I'm 5'9" and my horse is 15hh! Granted I'm skinny (don't hate me please! I can't help it.). 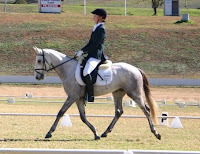 But anyway... We do well in dressage. We even tried a little hunter/jumper last summer for fun and ribboned every time. See my blog for pics of us. I don't look that stupid on him! As long as you aren't way too light or too heavy, then it's all about balance and how you work together. or Lendon Gray and Seldom Seen. I tried the formula on the page you linked and came up with 61, which was under the 75 they said was good. So that is good. My guy has big cannon bones for a shrimp, 8.5inches. Your analysis is very astute. I ride western saddles and the same logic applies. One thing you did not address with smaller horses, they are easier to mount. A 14.2h to 15h horse is much easier to mount. A 16+h horse can be a real chore to mount without a boost step. Although you appear to be riding thoroughbreds, Arabians are a popular breed and most of them are in the 14.2 to 15 size range. i'm 5'0" and love LOVE ponies my current horse is 14.2 and even in my dressage saddle my feet still don't go beneath her belly. but i also like to ride bigger horses, like 16.2, i look like a pea on them but i still like to ride them. AMBER, I love your pony! I'm 5'8". Growing up, I always rode TBs 15-16H. About 18 years old, I too liked the romance of a larger horse, but also realized it was not so sensible. (All our tack and blankets fit smaller horses for one thing.) When I was 22, I bought a 12 y.o. 11.3H welsh cob. We had so much fun together. The lady who sold him said he was too spirited for her kids and they were afraid of him. She also said he was a show pony from Carmel. I thought, "Yeah right, everyone selling a nice looking pony claims it was a show pony." Well, when I started riding him, he was very well trained indeed, so maybe it was true. He was too high spirited for inexperienced riders, but a great sport for anyone else. He loved to jump. We'd be on a trail ride and he would head for things to jump. I'd only jump the little things because I was too big. He was incredibly strong and very versatile. If you saw us you'd say, what's that chubby lady doing on that pony? But it worked for us. Fortunately a standard english saddle fit him. I like to visit large horses, but I think I'll always stick with horses in the 15-16H range. I'd also love to have another welsh cob. Ponies have a lot to offer riders of all types. According to my trainer, with the economy, the popularity of the "normal-size horse" (of the 15-16h range) is gaining. She also states that many re-riders, a growing population, favor smaller horses that are easier to ride and closer to the ground. I'm perfectly happy with my 15.1 hand horse. I can stuff her into any trailer and have no issues finding tack that fits. I also love being closer to the ground and having a sound teen-aged horse (knock on wood). I did ride a 17.1 hand 3 year old the other day and it was way too high! I was watching a heavy weight hunter class on TV, and while the horses fit the description of a heavy hunter, the riders were mostly proportioned for lighter hunters. In fact one petite lady rode every hunter type. In my old Horse & Rider magazines, there were more riders proportionate to the horse size. Maybe I'm a purist but I thought the purpose of the different classes is to show the horse performing correctly with the appropriate rider. I wondered if fashion goes against the larger rider so they aren't in the bigger televised shows anymore. I would like to see more of the traditional trappy cobs and ponies and heavy hunters. The all around horse with stamina, jumping ability and manners. This is such a good question to consider. I'm 5'6" with long legs. I ride 4 different horses all different heights and builds. The largest is the technically easiest ride, given his training, ability, and natural fit for his discipline. For me, it's about the "click" and feel of the fit. One of the horses I used to ride I just adored, and I think he was barely over pony sized. Yet we were a great "fit". This topic is dear to my heart as a short fat person. I have a 16.1 percheron mare and a 14.3 qh type mare. I am very self conscience of how I look on a horse. They are both very well built, but I am not going to ride my little mare until I have lost at least 20 more lbs. I agree, I think these are probably the basics to feeling comfortable! The horse I used to ride was large compared to the horses in our barn and area (16hh), and I am around 5'5". I loved the way a big horse felt, and since I road him for 5 years I got used to that feeling. Now I ride a MUCH smaller horse (really a pony) who is probably between 14.2hh and 14.3hh, and it is hard for me to get used to! I have had to replace most of the tack I used to use for my big horse, but she is much more athletic! I think I might be a bit weird looking on my barrel horse...we think he's half appy half arabian. I am 5'5 and he's 14.2hh. What do you guys think? great post! I am only 5'2" and I am always surprised by people my height wanting huge horses. I actually have this dream of having a business buying/training/selling sport ponies someday, since I am small enough to ride them. This may have been mentioned (I didn't read thru all the comments) but the bone structure and width of the horse also have a lot to do with where your leg falls on his side - not just height. I am around 5'6 and a med built 22 year old. I've always felt like I needed to make up my weight with my horse's hieght. I think it goes back to what the person said earlier, about our nation's body image. So I rode mostly 15.3 and above horses yet I always felt a little on edge on them just because their height was some what intimidating so I started losing the joy for riding that I once had, until I met Cowboy. Cowboy is a 14.3 sturdy built QH, he is such an amazing horse and I feel so safe and comfortable on him at his height going from taller horses. I also followed the link and drove back out to the barn in the middle of the night just to take his measurements because I've felt self conscious on him, we scored a 68. Long story short, I LOVE to ride again, I love this horse and in the end that's probably the most important thing about riding. Finding a best friend and sharing grand adventures together. We need to stop worrying so much about what other people are going to think about us and our horses. If they don't think you look good on the horse you love then they can turn their heads! And weight about 120...do you tbink im too big or tall for him...imo I feel better on my medium boned 15.3hh mare. Should I get something taller?